Last year, marketers spent more than $135 billion creating digital marketing content. Are you feeling overworked, overwhelmed, on the edge of a mental breakdown? You're probably a content marketer. Like Sisyphus forced to push a giant boulder up a steep hill, the content marketer is being told to create all kinds of content across many digital channels on a daily basis. Content runs the gamut: Tweets, email, messages, multimedia, social media, mobile, pitch decks, battle cards, ebooks, etc. "The obvious trend right now in marketing is content marketing," says Ayca Yuksel, director of global marketing and communications at BookingSuite, a business-to-business software arm of online hotel service, booking.com. "We've changed our content strategy over time, but the volume has only gone up." Over the past two-and-a-half years, content output has easily tripled, Yuksel says. From social to mobile to the Web, the digital world has served up a content-consumption smorgasbord. It's no longer simply pushing a marketing message. Yuksel says content marketing today is about participating in online conversations and hyper-personalizing content to regions and individuals. If all of this sounds labor intensive, you're right. Last year, marketers spent more than US$135 billion creating digital marketing content, according to BrightEdge, a content performance and optimization software vendor. Not just content creation, there's work to be done in content aggregation and amplifying unowned content. 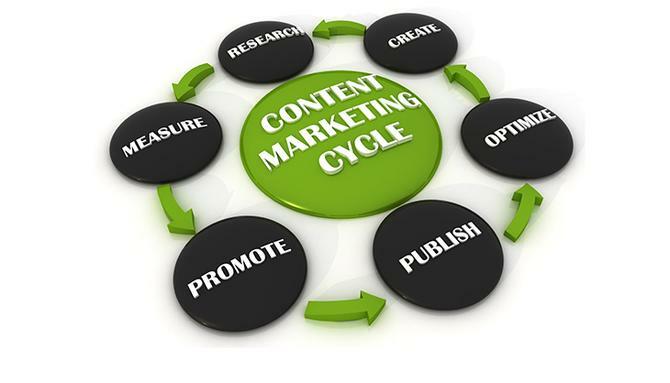 Marketing content has an array of goals, too, from brand awareness to education to thought leadership. "We're in the business of creating many different types of content -- pitch decks, white papers, ebooks -- that we use in our lead generation efforts, as well as part of our thought leadership efforts to get brand awareness," Yuksel says. "The company has a philosophy on very visual content, and so a lot of our external-facing content comes with pictures, videos and other elements that help individuals read through some of the heftier materials." With content a mile wide and a mile deep, no wonder content marketers' nerves are frayed. Even worse, a marketing department's fly-by-night content factory churns out lots of unused, ineffective, even downright bad content. According to Highspot, a sales enablement platform vendor, 70 percent of marketing content isn't being used. Social media is also littered with failed marketing content. Overwhelmed and ineffective aren't exactly winning traits for any marketing team. On the upside, the rapidly expanding marketing technology space hasn't forgotten about content marketers. New tools are coming to market to help content marketers work more efficiently. In a white paper called Decade of the CMO, Foundation Capital has put together a list of vendors aimed at content creation (such as Skyword, WriterAccess and Scripted), content curation (such as Uberflip, Listly and Curata), workflow management-analytics (such as Buffer, Contently and Kapost), and advocate management (such as DynamicSignal, Influitive and Klout). For instance, BookingSuite uses Highspot to figure out what pieces of content, say, a PowerPoint slide in a sales presentation, are most effective. Highspot's analytics engine can identify and score content even if it's been altered and personalized by salespeople to target a particular prospect. This "effectiveness" insight goes back into the content-creation machine to improve performance. "Our marketing content quality is changing," Yuksel says. "Our content is being used more by salespeople because we're able to incorporate some of their changes into our revisions." Similarly, BrightEdge's analytics engine uses SEO, social engagement and topical relevance to help marketers in their content-creation efforts. Penwell, a media company, uses BrightEdge to plan some 1,500 pieces of content each month. And Home Depot uses BrightEdge to get its content to rise to the top of the search page. Despite all the automation, analytics and efficiency tools, though, content marketing remains a labor-intensive practice that's swamping content marketers. "Our software doesn't write the content," says BrightEdge CEO Jim Yu. "Marketing content needs human beings."